Approximately 2:38 p.m. -- Two young men -- later identified as Tamerlan Tsarnaev, 26, and 19-year-old Dzhokhar Tsarnaev, by law enforcement officials -- are seen turning onto Boylston Street from Gloucester Street, according to a criminal complaint and affidavit filed by FBI special agent Daniel Genck. They are seen carrying large knapsacks. Approximately 2:41 p.m. -- Both suspects are seen standing about a half-block away from the Forum restaurant, located near 755 Boylston Street, by a security camera above the restaurant's entrance. Approximately 2:42 p.m. -- Tamerlan Tsarnaev separates himself from the crowd and makes his way east on Boylston Street toward the finish line. He passes Forum restaurant with the knapsack still on his back. Approximately 2:45 p.m. -- Dzhokhar Tsarnaev also moves toward the finish line, but stops in front of the Forum restaurant. He places his knapsack on the ground near the metal barrier. The barrier is near spectators who are watching the runners. The younger Tsarnaev stands there for about four minutes. He looks at his cell phone, "once appearing to take a picture with it." About 30 seconds before the first blast, he lifts the phone to his head and speaks for about 18 seconds. He finishes the call. The first explosion goes off within seconds. Approximately 2:49 p.m. -- An explosion occurs in front of 671 Boylston Street along the final stretch of the Boston Marathon. Seconds later -- A second explosion occurs in front of 755 Boylston Street, the Forum restaurant, located a block away from the first explosion. A suspect in the Boston Marathon bombings was taken into custody Friday, April 19, ending a massive manhunt that locked down the Massachusetts capital. Earlier, another suspect died from injuries sustained during a firefight with police. Editor's Note: The two suspects in the bombing were not involved in the robbery of a convenience store in Cambridge, according to Massachusetts State Police spokesman Col. Timothy Alben. Police initially indicated that they were involved in the robbery of a 7-Eleven convenience store in Cambridge. The violence begins late on Thursday, April 18, when a Massachusetts Institute of Technology police officer -- identified as Patrol Officer Sean A. Collier -- is found shot to death in his vehicle in the vicinity of Vassar and Main streets on the MIT campus, according to an MIT statement. The two suspects then hijack a Mercedes SUV at gunpoint in the vicinity of Commonwealth and Brighton Avenue, in the Allston area of Boston, according to Cambridge Police. It did not take place in the area of Third Street in Cambridge as previously reported. The carjacking victim escapes a half-hour later at a gas station on Memorial Drive in Cambridge, a law enforcement source told CNN. The suspects are now driving two cars. Police track the suspects to Watertown, a suburb just west of Cambridge. Between 12:00 a.m. and 1 a.m. Friday, a single officer is the first to encounter the two cars that Tamerlan and Dzhokhar Tsarnaev are driving, Deveau said. The officer calls in and is instructed to follow the suspects until backup arrives. At least seven officers arrive. The suspects stop the cars, get out and begin firing at the officers on Laurel Street. An intense shoot-out ensues. "We estimate there was over 200 shots fired in a five- to 10-minute period," Deveau said. During the firefight, the suspects detonate an explosive. They later discover it is a pressure cooker bomb, similar to the ones used at the marathon, the chief said. The brothers also allegedly throw other explosives at the officers -- not all of them detonate. After the final blast, a suspect -- later identified as Tamerlan Tsarnaev, 26 -- moves directly toward police, firing his weapon, Deveau said. He is tackled by an officer. While the officer tries to place handcuffs on the suspect, the carjacked SUV, driven by the younger brother, charges forward and runs over the suspect and drags him a short distance, narrowly missing officers. A source briefed on the investigation says Tamerlan Tsarnaev was wearing explosives and an explosive trigger. He dies later at Beth Israel Hospital. Fifteen police officers are treated at St. Elizabeth's Medical Center in Brighton, Massachusetts, for minor injuries suffered in the gunfight, according to hospital spokeswoman Jennifer Kovalich. The younger brother -- identified as 19-year-old Dzhokhar Tsarnaev -- drives off amid more gunfire. He drives two or three streets away, with officers in pursuit. He dumps the car on Spruce Street and runs into the darkness, according to Deveau. Law enforcement authorities begin conducting a search, going through "about 20 streets, door-to-door" but are unable to locate Tsarnaev. At a news conference during the 6 p.m. hour, authorities say they believe he is still in Massachusetts. Later, authorities receive a tip: A Watertown man tells police someone is hiding in his boat in the backyard, bleeding. It turns out to be the suspect. Officers arrive at 67 Franklin Street and can see Tsarnaev poking through the tarp covering the boat. Police use "flash-bangs," devices meant to stun people with a loud noise. They start 20 to 30 minutes of negotiation with Tsarnaev. Police ask him to lift up his shirt to make sure he has no explosives or weapons on him. An FBI negotiator is on the second floor of the house looking down at the boat, but he can't see Tsarnaev under the tarp. A state police helicopter overhead uses a thermal imaging camera to determine that Tsarnaev is alive and moving, Deveau said. A robotic arm was used to remove part of the tarp to reveal Tsarnaev. Eventually Tsarnaev stands up and lifts his shirt for the officers. "At that point, once we saw that, we felt comfortable enough to send some officer tactical equipment to grab him and pull him away from the boat," Deveau said. Boston Police announce on Twitter at 8:45 p.m. ET that a suspect is in custody. In need of medical care, the younger Tsarnaev is taken to Beth-Israel Deaconess Medical Center. A federal law enforcement source with firsthand knowledge of the investigation told CNN that a lid to a pressure cooker thought to have been used in the bombings had been found on a roof of a building near the scene. 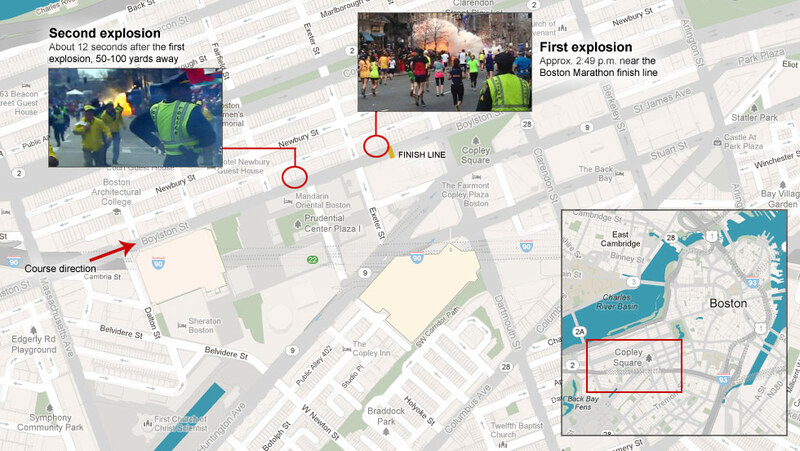 One of the bombs that exploded near the finish line of the Boston Marathon was housed in a pressure cooker hidden inside a backpack, the FBI said in a joint intelligence bulletin. The second bomb was also housed in a metal container, but it was not clear whether it too was in a pressure cooker, the FBI said. A knowledgeable source called the bombs "crude." Pressure cookers have been used in past attacks and plots. They're considered a serious enough threat that the Department of Homeland Security issued an advisory about pressure cooker bombs in 2004. Click through for a glance at the role of pressure cookers in the making of bombs. 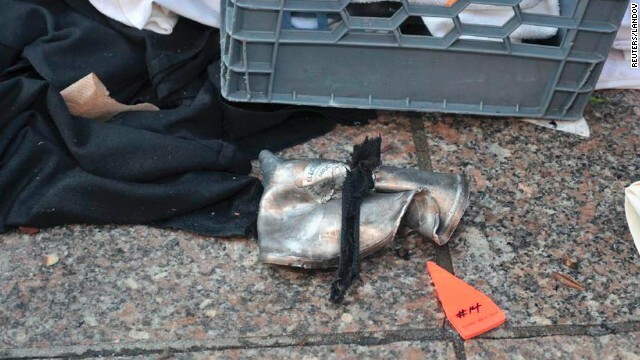 The two bombs -- each with the capacity to hold 6 liters of liquid, according to a Boston law enforcement source -- blew up seconds and a short distance apart on Boston's Boylston Street. Photos obtained by CNN, which were in a bulletin sent to federal law enforcement agencies, showed parts of a pressure cooker, a shredded black backpack, and what appear to be metal pellets or ball bearings. 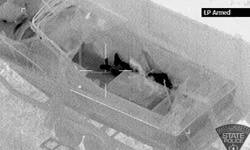 The parts found include a partial circuit board, which could be used to detonate a device. A CNN animation of how the apparent pressure cooker bomb may have been set up. The device contained fragments that may have included nails and ball bearings, the FBI said. Part of a circuit board was also found, which might have been used to detonate a device. The Department of Homeland Security issued an advisory about pressure-cooker bombs in 2004. Bombs are made by placing TNT or other explosives in a pressure cooker and attaching a blasting cap at the top of the pressure cooker, the advisory said. "The size of the blast depends on the size of the pressure cooker and the amount of explosive placed inside. Pressure cooker bombs are made with readily available materials and can be as simple or as complex as the builder decides. These types of devices can be initiated using simple electronic components including, but not limited to, digital watches, garage door openers, cell phones or pagers." A computer screen grab of al Qaeda's Inspire magazine from July 2010. There is no evidence of AQAP involvement or of any of its supporters in the Boston attack. And such a formula is certainly not unique to AQAP. Variations appear all over the Internet. A senior U.S. counterterrorism investigator told CNN that pressure cooker bombs have also been a signature of extreme right-wing individuals in the United States, who he said tend to revel in building homemade bombs. Some past terror plots have used pressure cookers. In 2010 in Times Square, Pakistani-American Faisal Shahzad (right) tried to detonate a vehicle bomb that included "a pressure cooker containing approximately 120 firecrackers," according to a 2010 DHS bulletin. In July 2011, Naser Jason Abdo (left) attempted to attack fellow soldiers at Fort Hood using a bomb, police said. After Abdo's arrest, police searched his hotel room and backpack and found 6 pounds of smokeless powder, Christmas lights and battery-operated clocks -- which were apparently intended to create a timing and triggering device -- sugar, shrapnel, a pressure cooker, and shotgun shells that were being dismantled for raw explosives, a Defense Department official told CNN. Credits: Reporting: Paul Cruickshank, Tim Lister, and CNN staff in Boston, New York, Atlanta and Washington. Design and development: Sean O'Key and Manav Tanneeru.